1. Cover eggs with cold water by 1 1/2 inches in a 4- to 5-quart pot and bring to a rolling boil, partially covered with lid. Reduce heat to low and cook eggs, covered completely, 30 seconds. 3. Peel eggs and halve lengthwise. Carefully remove yolks and mash in a bowl with a fork. 4. Add mayonnaise, mustard, pickles, celery, and salt and pepper to taste to yolks and stir with fork until combined well, then spoon or pipe the mixture into egg whites. 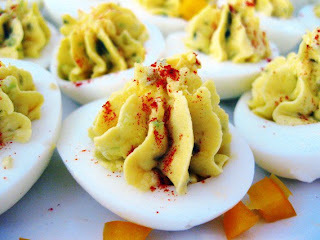 These were creamy, dreamy and I would only top with some chopped chives...groovy appetizer, BABY! Back in the day this was one of the first things we made in Home Ec. I still love them, but haven't had them in a very long time.